The artifacts, which could be nearly 2,000 years old,were found in the Blackfriars area of Leicester, the English city where the long-lost bones of King Richard III were discovered under a parking lot in 2012. Wardell Armstrong Archaeology was brought in to dig at a site where a construction company plans to build student housing. At least one of the tiles is tainted with dog paw prints, and one is marked with the hoof prints of a sheep or a goat that trampled on the clay before it was dry. 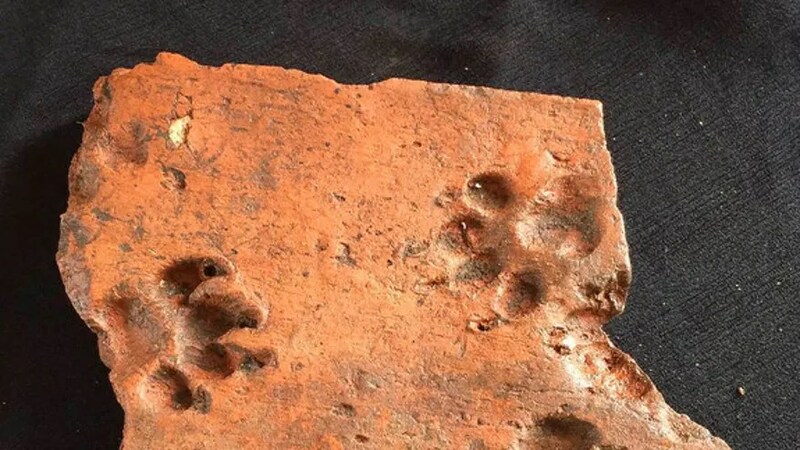 “My initial thought was that it must have been very difficult being a Roman tile manufacturer with these animal incursions going on all the time,” Philip Briggs, another Wardell Armstrong archaeologist, told Live Science in an email. The tiles were found in layers of rubble that had been laid down as a hard base for subsequent floors, but the artifacts’ original context is unclear, Daffern said. “We don’t know if the tiles were originally part of an earlier building or were bought in from elsewhere specifically to raise and stabilize ground,” Daffern told Live Science in an email. Leicester was the stronghold of an Iron Age group known as the Corieltauvi tribe, and it remained an important city after the Roman conquest of Britain in the first century A.D., as it was located along the Fosse Way, a Roman road that connected southwestern England with the East Midlands. The excavators say that, in addition to the animal-printed tiles, they’ve uncovered Roman tweezers, brooches, coins and painted wall plaster. They’ve also unearthed traces of a large Roman building perhaps a basilica, with a peristyle, or columned porch that was largely robbed of its masonry during the medieval era for other construction projects. The archaeologists even discovered late Iron Age artifacts, such as several fragments of clay molds that the Corieltauvi tribe likely used to make coins before the Roman rule. Daffern said it’s rare to find sites with coin molds, given how closely managed coin production would have been during the Iron Age. “I think the excavation thus far has significantly multiplied the number of coin mold fragments recovered from Leicester, probably by approximately tenfold,” Daffern said in an email. The excavation is funded by construction company Watkin Jones. The archaeologists are providing updates on Wardell Armstrong Archaeology’s blog.